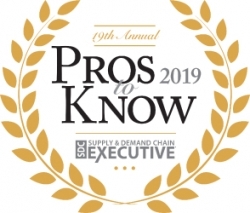 Supply and Demand Chain Executive recognizes members of Source One’s Spend Management team as 2019 "Pros to Know." Willow Grove, PA, February 23, 2019 --(PR.com)-- Source One, a Corcentric company, is proud to announce that Supply and Demand Chain Executive (SDCE) has included three members of its Procurement optimization team on this year’s list of Provider Pros to Know. 2019 marks the ninth-consecutive year that Source One’s experts have earned this recognition. This year’s honorees include Source One Senior Analyst, Samantha Hoy and Consultants, Kaitlyn Krigbaum and Elizabeth Skipor. At the start of each year, SDCE recognizes Procurement services providers and practitioners from consulting firms, software companies, and institutions of higher learning for their accomplishments in addressing supply chain challenges for their organizations and their clients. As Pros to Know, they provide an example for emerging supply management professionals and an idea of what Procurement’s future could look like. Source One’s award-winning team will join thousands of other Procurement professionals at ISM2019 this April. In addition to sponsoring the conference, they are once again hosting the private ExecIn Forum. Featuring two days of customized presentations and unique networking opportunities, the event brings together many of Supply Management’s most insightful and forward-thinking leaders. Senior-level executives of non-consulting organizations with an annual revenue of over $1.2B are encouraged to contact Carole Boyle (cboyle@corcentric.com) to express their interest and learn more about this exclusive opportunity.